Contrary to blackjack, where skills and knowledge can significantly influence the outcome of every hand, baccarat is a game of pure chance. However, throughout the years a great deal of research has been carried out in attempt to find a solution that enables players to win in the long term. Many professional gamblers have also come up with various ideas which suggest different ways to improve the game. Even though, it is not possible to have an impact on the outcome of every coup, there are a few strategies which players can use when it comes to managing their money and placing their bets. When it comes to baccarat, it is essential to set a plan beforehand and follow it throughout the course of the game. This way players will be able to reduce their money losses as much as possible and make better betting decisions. It is also compulsory to have money management skills and discipline. Since players entirely rely on luck for the outcome of every coup, these skills are a must as they will enable them to successfully control their funds. Up to this moment, it has been concluded that by the time players identify the pattern the game follows, it changes and therefore, it is not possible to obtain the desired useful information of which bet should be placed next. Even though, there are many available betting systems, it has been proven that they are not efficient enough in the long term. They are considered to be rather ineffective as players cannot use them to improve their bankroll over long periods of time. Just like other card games, baccarat also has various developed systems which can be applied during the course of the game. It is quite controversial how effective they are. On the one hand, many players use such systems which arises the question whether they work after all. Some gamblers believe that they have mastered the game as they have come to know about the baccarat systems. On the other hand, from a statistical point of view, none of these systems have proven to have a long-lasting impact and therefore, they don’t influence the players’ bankroll in the long run. There are two types of betting systems, with a negative and with a positive progression, which gamblers can employ when playing baccarat. Some of the most popular betting systems include The 1-3-4-6 System, Martingale, Labouchere System, Paroli and others. Most systems work on the same principle – they aim at providing players with a plan how and when to place their bets. The main goal of every developed baccarat system is to reduce the players’ money losses as much as possible, rather than help them win more. Since baccarat is a card game, one of the strategies that first comes to mind is the card counting. Even though, in other card games such as blackjack, the card counting has proven to be highly effective and useful, when it comes to baccarat, this is not the case. Many professional players have attempted to gain an advantage over the casino by keeping track of the cards and as a result, they have drawn two conclusions. The first one is that card counting in baccarat is extremely difficult and the second one is that even if players are able to successfully do the math, they won’t gain much advantage over the casino. Baccarat’s house edge is already one of the lowest in the gaming industry and it is not worth all the efforts, if the result won’t be satisfactory. 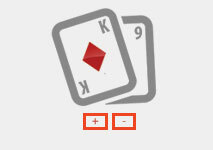 However, in case that players would like to try this method after all, there are many available card counting systems. In most casinos, when baccarat players first join the table, they are offered pens as well as score cards which are free of charge. This way, they have the chance to keep a record of the outcome of each coup and the wagered money. The reason why such cards are provided in the first place, is to help players find the trend the game follows in order to make better betting choices. If players decide to take advantage of the provided score card, they should know that there are several ways to do so. It is entirely up to them which method, they will choose in order to monitor the game history. Usually, on the score card, players can see a few columns which are conveniently separated into two sections, labelled with the first letter of the Banker and the Player bet. Keeping a score card is useful, not so much in determining the pattern of the game as it changes constantly, but because it also allows players to keep track of their wagers. This way, they have the chance to manage their money better and be aware of their bankroll at any point during the course of the game. The most important thing which players should consider, prior to playing, is the three available bets, they can choose from. It is essential to get familiar with their odds and their house edge in order to be able to figure out which one gives them the best chances of winning. This way, they will be able to create a strategy in advance and reduce their money losses, at least to some extent. Baccarat is a high-stakes game and therefore, it is highly recommended to know which type of bet offers the best odds as otherwise, players risk losing substantial amounts of money. If players consider the opportunity to place the ‘Tie’ bet, because it has the biggest payout, they should be warned that it has also the highest house edge which makes it unfavourable. It is not prudent to put this bet and though it may seem enticing, many baccarat experts advise to simply stay away from it. So, what is the best option when it comes to placing a bet in baccarat? Theoretically speaking, the wager with the best odds is the Banker one and the second best is the Player bet. However, baccarat is a game of chance and therefore, it is not possible to predict which hand will be the winning one in the next coup. Players may choose to wager every time on the Banker bet, taking into account the fact that it’s the bet that occurs the most. Following a bet consistency is a good idea as the chosen bet will inevitably win at some point. Or they can simply follow their gut feeling and hope for the best. In baccarat, players completely rely on luck and therefore, trusting their intuition is also a fine choice. Another important aspect, which players should always consider, concerns their bankroll. It is essential for them to be able to manage their bankroll and keep track of all of the wagered money. It is also crucial to set a money limit and strictly adhere to it. In order to do that, players need to have money management skills as well as discipline. The reason why it is so important to be able to successfully take control of their funds, is that even if players get lucky and win, without such skills, they will easily spend all of the money they’ve won. The game has predictable long-term results which can be determined by looking at its odds and probabilities. It is established that the Banker bet wins the most which is the reason why the casino gets a 5% commission. The house edge of this bet is also the lowest and therefore, players are most likely to win by placing it. However, the truth is that it is not possible to predict which hand will win the next coup even if, for example, the Banker has won the last ten games. The probability of winning will be always 50/50 and there is no intermediary position – one of the three possible outcomes will inevitably occur. It is possible that players will get lucky and hit a jackpot as some baccarat games offer this option. In such cases, prudent advice would be to leave the game in order to retain the winnings. Otherwise, it is most likely that players will lose all of the money they’ve won as in the long term there is no way to predict the result of every round. It is also worth mentioning that players should never allow their emotions to determine their betting choices. If they feel upset or desperate, it is best to refrain themselves from placing a substantial amount of money as in such moments, they are deprived of the ability to see the consequences of their actions. The many available strategies and systems don’t guarantee success in any case as in general, the game’s outcome cannot be influenced by relevant skills and knowledge. Players should enjoy the game and have fun by guessing which hand will win and in the meantime, they can even get lucky and win some money. The main reason why the game has been a source of entertainment for years is because it provides players with a high level of entertainment and excitement. The bottom line is that there are some available systems and strategies which might work on a particular round. However, baccarat still remains a game of luck and as such, players can’t do much to change its final outcome. In order to make the most of every game, they should get familiar with the bet types, the best bet choice, the basic rules and the money management plan. This way, they will be able to fully enjoy baccarat and try their luck on some of the three bets. Even though the game cannot be influenced as much as other card games can, it has a moderately low house edge which gives players good chances of winning.